Like to be close to the lake? 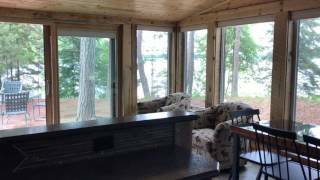 Our Juniper cabin is 25 feet from water’s edge! One of the best lake views is from the upstairs loft - it’s like being in a treehouse. Cabin time around here means fun on the lake: Swimming, canoeing, kayaking, pontooning, water skiing, tubing, jet-skiing and sailing. Yet, you can still find the solitary fisherman working the bays. Memories are made here! Cabin has 5 (floor to ceiling) picture windows that offer amazing views of Pine Cone’s quiet bay. Also inside is a well-stocked kitchen which features a vaulted knotty pine ceiling. If you bring or rent a smaller boat, you can enter Big Sand Lake through the tiny inlet from Lake Emma and the outlet to Lake Ida. Experience the unique small town of Dorset which hosts several festivals during the summer, offers restaurants (the “Restaurant Capital of the World”), general store, antique shop, an artisan shop and more. Exceptionally clean and clear water is just steps away. Imagine soaking your toes and fishing for dinner. Get the net! Walleye (between 20 and 28 inches must be released), Rock and Largemouth Bass. Northern Pike, Bluegill, Crappie and Smallmouth Bass are on the menu. Bring your own boat, or rent one. Enjoy water sports of all types: Pontoons, jet skis, fishing boats or ski boat are available. Since you book directly with us, we can give you lots of tips on area things to do for all ages. We can have your boat waiting for you! Big Sand Lake is known for its sandy beaches, heavily wooded 8 mile shoreline, and clean water. Nearby is the famous Heartland Bike Trail; Itasca State Park; Paul Bunyan State Forest–This is Paul Bunyan Country! You’ll need a week or two to explore the lakes and find adventure. Like Birding? A large number of birds and waterfowl call the area home.